A couple of weeks go marked the first "Cookbook Club" dinner with about six of my friends from chef school. Once a month we decided get together and cook. The host chooses a cookbook and each person is responsible for preparing one of the parts of the meal! The first cookbook chose was French Taste by Laura Calder. I made the appetizers, which I will later share, but one of the dishes that really stuck with me was my friend Kyle's orange & fennel salad. Two fabulously fresh and interesting ingredients. The purple flowers that garnish the photo below (of Kyle's dish) are chive flowers, and I think an absolutely gorgeous touch to a summer fresh dish. - Trim the fennel, reserving a handful of green fronds. Cut into slices about 1/4-inch thick. Heat a little olive oil in a saute pan, and, working in batches and seasoning with salt and pepper as you go, fry the fennel on both sides until golden and tender. 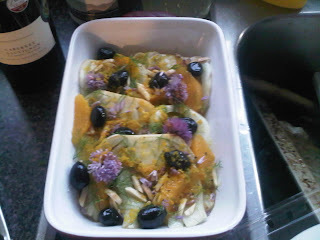 As the fennel is done, arrange it on a serving platter. - Zest the orange and set the zest aside. Remove the skin with a sharp knife, taking care to remove all the white pith from the fruit. Discard the peel. Cut out the orange sections, arranging over the fennel, and squeeze the orange juice over the whole salad. - Slice the onion into paper thin rings and arrange over the salad. Scatter over the olives and pine nuts. Squeeze over lemon juice, to taste. - Drizzle over a little more olive oil. Finally, scatter over the reserved fennel fronds. Serve.